It’s a two-pastor household on Humboldt Boulevard. Every Sunday morning Pastor April Berends heads for St. Mark’s Episcopal Church on North Hackett just off Downer Avenue where she is the rector. Husband Drew Bunting heads out to Resurrection Church in Mukwonago where he is the vicar. April grew up in Grand Rapids, Michigan, “pretty much straight acrossthe lake from here.” She was the eldest of four, with two younger sisters and ayounger brother. 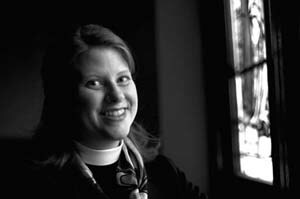 She has three uncles ordained in the Reformed tradition, anddid her undergraduate work at Calvin College. She chose a more ecumenical divinity school. “It was difficult for awoman to get ordained” in the Reformed tradition, she explained. It was at Yalethat she found both her future husband, Drew Bunting, and the Episcopal Church. But her family understood. “My father cried every time he took communionfrom me,” she recalled. “And it wasn’t because he was sad.” It would be herfather who eventually brought her back to the Midwest, but not before someother adventures. “I graduated from Seminary in 1999. After college I worked with youngpeople. As part of my seminary experience I worked with homeless residents innew Haven,” April explained. Her husband was ordained before she was, and wentto work as an assistant rector and chaplain at an Episcopal school in Miami.She went with him, and worked for a time in the area of HIV AIDS. “My work shaped my ideas of where the church is supposed to beinvolved,” she said. April was ordained in 2004, and after six months as a deacon she wasordained a priest in the summer of 2005. She found work on the staff of theNational Cathedral in Washington, DC. Drew was also in Washington, serving as associate priest at St.Columba’s Episcopal Church – one of the largest in the diocese. But things were changing. April and Drew knew they wanted a family, andwere thinking about getting closer to home. When April’s father was diagnosedwith cancer, they decided to leave the east coast. They came to Milwaukee in September of 2008. In May of 2009 they movedinto their house in Riverwest. “We knew that if we were going to serve the city, we wanted to live inthe city. We liked Riverwest right away. It’s the first place we’ve ever owneda home,” April said. “We have a big kitchen, a sunny yard. I like to garden. We both like tocook. We grew most of the vegetables we ate this summer, and had enough toshare. I can walk or ride my bike to the office. One of us stops at Alterraalmost every day. Neighbors stop by and say hello. They close the garage doorfor us if we forget. “We love to walk around the neighborhood. We go to Center Street fordinner at Centro, or over to Nessun Dorma. And serving the congregation at St. Mark’s is important to April aswell. The congregation is active in a number of local and national issues. Theysupport Pathfinders and Sojourner Truth House. They’re also involved withCommon Ground, the national organization addressing justice issues insoutheastern Wisconsin. Two areas of concern are banks’ accountability inforeclosure situations and the creation of a health care cooperative to makehealth care more accessible and affordable. “Action and faith are one and the same in St. Mark’s,” April reflected.“Many congregants are involved in community ministry. They are involved in goodwork – quietly. “They take good care of one another, too. They’re always ready to helppeople who are in need. She’s already making education plans for the baby that will be bornsometime in March. Open house with free cider, cookies and a craft for kids. Joyful worship service featuring the children of St. Mark’s, offering aretelling of the story of Jesus’ birth. Children’s sermon and familiar carols. The 10pm Christmas Eve service will include carols, selections by theSt. Mark’s choir and a candlelight recessional.